Ani just tried to show me how to Knit in the Round using four DPN’s (that’s knitting leet-speek for “double-pointed needles.”) She cast on her stitches in about .8 seconds flat and showed me the basics. I went back to my desk and gave it a shot… and I think I knit the same subsection three times in a row because I couldn’t figure out which needle came next.The working yarn is always hanging off the one needle I’ve just finished, and the other needles are all hanging there in random fashion and I don’t get it and it pisses me off. I wish I didn’t like it as much as I do. The other night, I started knitting a scarf for Mike Neir. It’s very nice yarn, but I’m juggling three colors that don’t get cut each time I switch, but rather, are carried along the sides. It’s a rib stitch (knit 2, purl 2) that’s not relaxing and rhythmic – at least not for this novice, because every time I switch front to back, I have to rethread the yarn through my fingers and retension it. So it’s knit 2, bring yarn to front, readjust everything, purl 2, take yarn to back, readjust everything. Not. Relaxing! But I muddle through. And then I dream. I dream about knitting, and the yarn gets confused with gluten, and I start worrying I’m causing allergic reactions by having all this gluten yarn all over my hands, but even in the dream I realize that can’t be right but I can’t out-logic the dream and it all ends up in this very worry-inducing state of disarray. Due to the flu the week before last, I had to skip the third and final knitting class, which is kind of a bummer, and I’m hoping I might be able to sneak into the next batch’s final class. It was going to be a tour of the store, learning about projects and weights and which yarns are good for what. I could use that schooling. Instead, I stayed home with a high fever and redecorated my bathroom in a weird fugue/haze combination. In the second class, we all showed everyone our dishcloths. The awful, wretched, unfun dishclothes that were made with the awful, wretched, unstretchy cotton yarn. 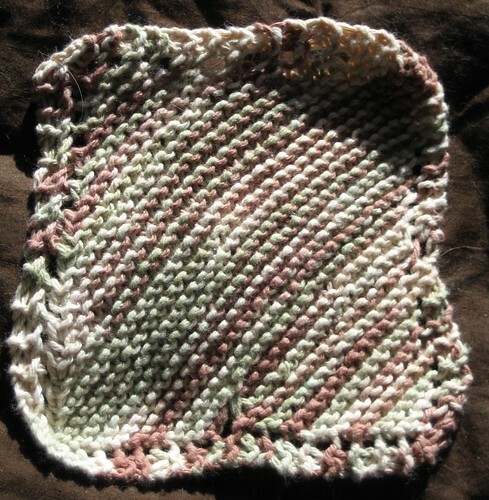 It wasn’t a fun project, although I must say, that dishcloth is really useful – it scrubs everything. It gets eggs off stainless steel! Dried milk off glasses! Worth the $30 price of admission? Meh. But here it is. My cloth was about 50% smaller than everyone else’s – because I knit as tightly as I possibly can. All that tension I carry around in my neck and shoulders? Translates directly through the needles. I read this entry from Amy a la Mode the other day and recognized many of my own thoughts and frustrations. I’m slightly beyond some of them now, but not so far as to not feel her pain. Also in the second class, we learned how to purl and were to choose a second, more advanced dishcloth pattern from our little book o’dishcloths. I picked an attractive diamond pattern and consciously worked more loosely. I merely draped the yarn over the needle and worked it through. The result was definitely a looser knit, but I erred on the side of “too loose” and ended up aborting the project halfway through. I finished up my scarf a day or so ago, apart from weaving in the tails… not sure how to accomplish that with the super-chunky yarn, as even my tapestry needles aren’t going to be large enough. There’s a really cute cardigan at Threadbear I’d like to try, but I’m terrified of sweaters. There’s still so much I don’t know! I know the basics – K, P, ktog2, ptog2, sl 1. PSSO? Nope. Ktbl? Negative. KLL? Forget about it. I know this will all come, but I am plagued with my usual self-doubt coupled with the stupid non-working fingers issue that seem to prevent me from using round needles or any needles that can’t be wedged into my thigh. Well, not completely true – I can use them, badly, and in extreme slow-motion. No cute hand-made socks or adorable cardigans in my future, I suspect. No, there will be scarves and cowls and frogging and angst. But damn it, I am going to get this. 4 responses to Knitting in the Buh? You look like you are coming along! The last class you missed I sent Corrine in with your hat since I am working like crazy lately. While she did not find you she did talk to Rob and reminded me I do need to support them being the local folks. I signed up for the same class for Sundays in March! Crossing fingers that I won’t get scheduled to work! Since the last couple of times I have been there they haven’t had the straight needles in the size I need the woman convinced me to get the round ones. Can I say I am scared of them! I am hoping you received you hat, I mailed it and am hoping the USPS did not eat it up! I worry about mailing stuff always think it will disappear! I think knitting is something that takes time. I am told crocheting is more forgiving so I guess knitting holds a grudge? I think after I start (or am hoping atlesast) this will all make sense! Maybe in the future we can tackle a class together! I don’t do good on the girly talk either! I am now in love with weaving though after doing it at the fundraiser! The only pain is loading the loom. But wow! I found a local place that sells looms and am ready to take some tax refund money and start that! I am impressed with your drive to keep working on it! Tonight my learning how to machine sew class! If they can teach me that they deserve a metal! I think the multiple needle thing is petrifying! I can’t believe you are trying it! Keep up the good work! So glad that my husband told me about your blog. I’m enjoying your adventure into chickens and your frustration with fiber arts. Last night I had a melt down with my crocheting. You post about your knitting was timely. If you’re confounded by quilting, I’m confounded by knitting and crochet! My sister tried to show me some crochet and all I could manage was one looooong chain! stopping by from PEAR and I think I’ll pass your blog on to my knitting sister since she’s vegan and a gardener and I think she’ll enjoy reading your blog.